We all have a love-hate relationship with social media. We hate it for the superficiality and narcissism it encourages, the fake news it spreads, and the way some people feel emboldened to say the nastiest things from behind a screen. But we love social media for its duality- the power it has to simultaneously disseminate critical information at a speed the world has never seen before, to grow awareness around fringe issues that normally go unheard, and give voice to raw personal stories. And we certainly love It for the wonderful little boosts it delivers our businesses, for free. With big box stores and Fortune 500s drowning out most mediums, #smallbusinesses need to utilize these free platforms more than ever. While the thought alone of managing yet another social media account might feel totally draining, especially when you’ve been neglecting your personal Facebook messages for the past two years hehem, there are free tools available to make it all much easier to navigate, and maybe even enjoyable. Here’s a list of my fave free apps to help streamline your social media management. If the thought of graphic design makes your skin crawl, then Pablo by Buffer is your saving grace. This free tool has simplified the design process so well even your grandma could do it. Seriously- it’s as easy as choosing a template and photo, customizing your text, then styling your image. You can adjust the size of the text, change the font type and color, switch the photo to faded, blurred or black-and-white, move things around however you’d like, and even add your logo! 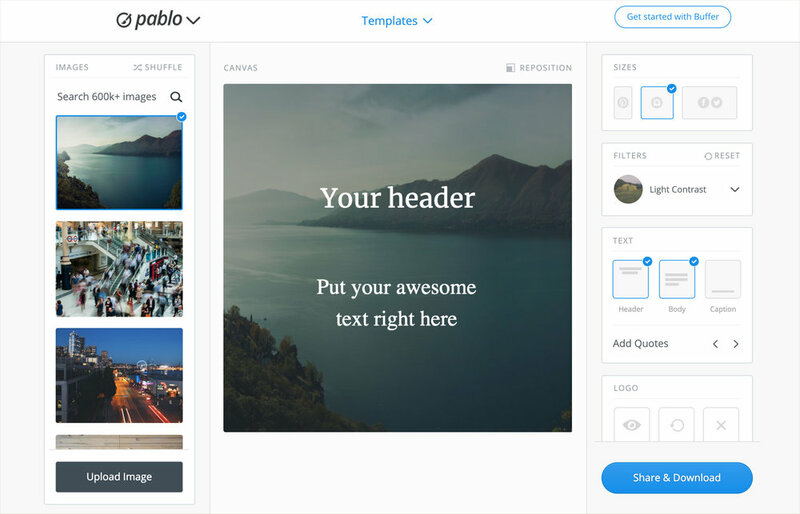 Pablo will automatically resize your image according to the social media platform you select (in the top right) so you can be sure it’s optimized for a best fit. Instantly share to Twitter, Facebook, Instagram or Pinterest with a single click, or schedule up to 10 posts per connected social media account. You can also download the image directly to your computer or phone to use in a blog post, newsletter, or anywhere elese you’d like. VSCO is a free mobile app that offers beautiful presets (aka filters) and powerful editing tools to make your photos and videos even more beautiful. The standard range of editing tools include exposure, contrast, cropping and skewing, sharpening, clarity, saturation, tone, white balance, vignette, grain, fade and tinting. You can also save your favorite combination of edits as a “recipe” to instantly recreate that same look to stay on brand with all your other photo edits. VSCO is also a social network of its own, allowing you to follow other creators and share your photos with the VSCO community. Your Instagram gallery (aka grid) is your hook- when someone new stumbles upon your account that is the first thing they see. If they dig it, they’ll probably peruse a few posts before following you. If they don’t, you’ll likely never hear from them again. If you want to up your Instagram game and create a beautifully balanced and cohesive gallery, I highly recommend the free app UNUM. Instagram (besides Pinterest) is the most visually driven platform of the bunch, so considering how your profile will look is a smart move. UNUM helps you visualize your gallery before you post, allowing you to upload images to the app and shuffle them about until you find the arrangement you like best. The app also offers data-driven insights such as best times to publish, your top posts, and general analytics for content engagement metrics. UNUM also features various publishing capabilities, such as allowing captions to be drafted in advance, Phantom Mode which allows you to temporarily hide content that you’ve already published on Instagram, and Grid Shift so you can shift and shuffle your content’s alignment. Add as many Instagram accounts as you would like to manage on UNUM. When you’re ready to share your post, publish it directly from the app to Instagram, Facebook, an email or text message, or download the content straight to your phone. Hootsuite’s free plan allows you to manage up to 3 social media profiles in one place, all with one password. Schedule up to 30 posts in advance each month, track mentions, follow topics of interest with the custom streams feature, engage with followers, and measure the effectiveness of your content with analytics reports. Hootsuite also offers free social media courses for those who want to dive deeper, as well as a robust help center and community forum. PLEASE TELL ME ABOUT YOUR FAVORITE FREE SOCIAL MEDIA MANAGEMENT TOOLS IN THE COMMENTS BELOW! Should I Have a Separate Instagram Account for my Personal Business?